It is sufficient to only add Water and Yeast to the “Full Wheat Bread Powder Mix”, which is made from the mixtures of carefully picked Wheat Flour, Cornflour, Soybean Flour, Crushed Corn Balls, Salt, Wheat Gluten, Sunflower Kernel, Millet, Vegetable Oil, Turmeric Extract and Spice Mixtures. 500 gr of bread mixture is poured into a deep cap. 320 ml of water (approx. 2 water glasses) is added. Then yeast is added to the mixture. The mixture is kneaded with knead dough apparatus of the mixer or hand, for 10 minutes. The prepared dough must be smooth-even, and at the consistency of an earlobe. The dough is covered from up top, but not so much as to dry, and conditioned for 30-35 minutes. Shapes of small or large bread are given, as wished, and then conditioned again in a mildly oiled tray or tablet, for 40-45 minutes and at 30-35 °C temperature. 500 grams of bread mixture is poured into the bunker of the machine. 320ml water (approx. 2 water glasses) is added into the mixture. Lastly, yeast is added, and the 3-hour main program of the machine is selected, and the mixture is cooked. As long as kept away from all sorts of substances emitting any odor or having any taste, and in a cool, moisture-free and odorless place of maximum 25 °C temperature, the product protects its attributes until its expiration date. 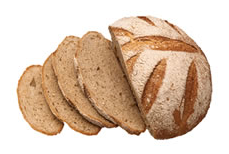 For better puffing-out of the bread, use cold water on hot summer days and cool water during winter. After shaping the bread, you can splatter flour on them and make lines with a knife. If you wish your bread to be shinier, place a heat-resistance cap, containing water, into the cooking section of your kiln. Cool down your bread on a cullender, when it is baked, and then cut the bread.